10 days from £7315pp plus international flights. A safari in two of Zambia's best parks with a mix of wild luxury, remote locations and incredible wildlife. 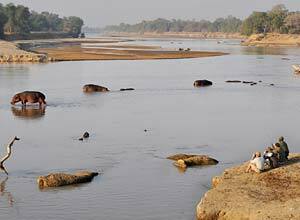 The Luangwa River snakes through South Luangwa National Park giving an attractive focus to this very pretty reserve. 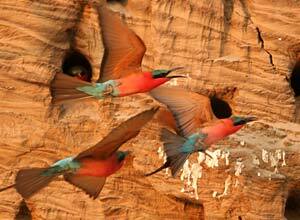 But not only is it beautiful here, the wildlife viewing is amongst the very best in Africa. With a mix of day and night game drives and guided bush walks you will really get a wonderful chance to see some excellent game in your 6 days here. There is a great population of lion, elephant, hyena, antelope, hippo and hundreds of bird species. 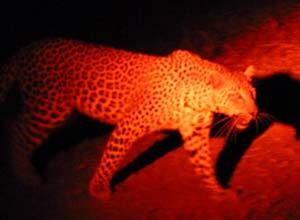 The night drives provide the nocturnal action with a good chance of seeing leopards, plus other more elusive creatures such as porcupines and the beautiful scops owl, to name but a few. 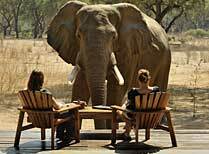 Your 3 days in Lower Zambezi give you a great place to relax by the river but to also continue to experience a fantastic big game safari. Being right on the banks of the mighty Zambezi means you could see large herds of buffalo, waterbuck lining the shores and even swimming elephants! 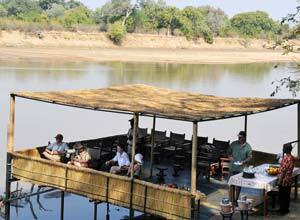 And, something you won't have been able to do in South Luangwa, boating safaris are also an experience not to miss. This safari uses three gorgeous camps. Two of these are bushcamps, which means you have a really authentic African wilderness experience. Just because they're rustic though, don't expect 'basic' in terms of food, service, guiding, comfort ... in fact the whole experience. This is luxury rustic! When you arrive in Lusaka, you will be met and helped to board a small plane flight to Mfuwe. Depending on the type of aircraft this will take around 2 hours. 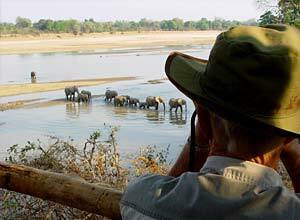 Here you meet your guide and drive through the village of Mfuwe to South Luangwa National Park. It's only about 45 minutes to the park, then you can enjoy a game drive en-route to your camp. After lunch, you'll head off for your first safari. Based at Kaingo Camp, you can choose from game drives, bush walking and spending some time in the various hides which this camp is famous for. The game surrounding the camp is excellent - large herds of buffalo, zebra, eland, and in particular the Cookson's wildebeest (one of the few remaining herds) frequent the woodlands close to camp. Today, perhaps you could spend some time in the elephant hide, or maybe even in the hide down by the water's edge for some hippo-action! Photographers will love staying at these camps run by Derek and Jules Shenton, as the hides can make such a difference to you getting that perfect shot! 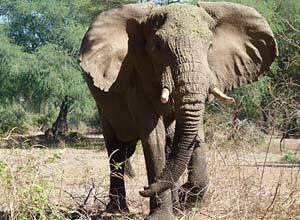 Today you will be transferred deep into the woodlands to your bushcamp, game driving en-route. The nights around the camp are filled with action. Bats and owls set up the background together with whirring cicadas. Puka and impala alarm calls are often followed by the grunt of a leopard or whoop of hyena as they pass through the camp. 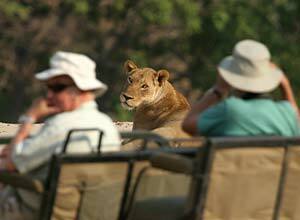 Mix your days up with day and night game drives and guided walks. 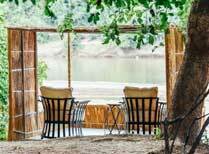 You can also relax by the waterhole hide and watch the passing wildlife. The 'Mwamba' pride of lions are frequent visitors to the area and should give you some fantastic photo opportunities. Your last day based at Mwamba Camp in South Luangwa. Enjoy your last day in this pretty park which is one of the best wildlife viewing reserves in Africa. 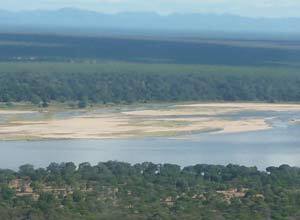 Today we take you back to Mfuwe airport and you fly to Lower Zambezi National Park, via Lusaka. Meet your new guide and drive to you beautiful riverside camp, enjoying the change of scenery and waterside flora and fauna. 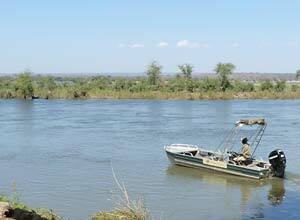 Your wilderness activities in Lower Zambezi include game drives, bush walks, boating safaris, fishing and canoeing. The Zambezi River has huge populations of hippo, plenty of bird species and enormous crocodiles. You'll find large lion prides and solitary leopards range between the escarpment and the river which allows for exciting game experiences, and the park is full of antelope and smaller creatures. 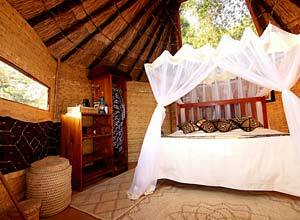 To most guests Old Mondoro gives an 'authentic' African bush experience. 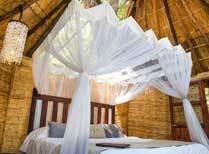 It's luxury, but rustic luxury, and one of our favourite camps in Lower Zambezi. Take life slowly and enjoy your last full day in the wilds of Zambia. After an early breakfast you will take a sunrise flight back to Lusaka in time to connect to your onward flight. Price notes: 2019 price guide per person: May-Jun £7315. Jul and 1-15 Oct £8434. Aug - Oct £9094. Full board accommodation, local drinks, daily game activities, park and concession fees and internal flights (Lusaka-Mfuwe / Mfuwe-Lusaka-Lower Zambezi / Lower Zambezi-Lusaka). International flights, visas, departure taxes, premium drinks, travel insurance, optional activities and items of a personal nature. You need to fly into and out of Lusaka for this trip. Return flights from the UK will cost from about £900 pp. Departure dates: Since this is a tailor made itinerary we can arrange this at any time you like subject to availability. We can also change it in any way too. Most changes will affect the cost.